Format: MarkdownItexI needed an entry to be able to point to which collects pointers to the various entries on "dualities" in string theory. So I created one: _[[duality in string theory]]_.
I needed an entry to be able to point to which collects pointers to the various entries on “dualities” in string theory. So I created one: duality in string theory. Format: MarkdownItexI have started to work on a hyperlinked [overview table](http://ncatlab.org/nlab/show/duality+in+string+theory#Overview) of string dualities. It's far from done and not quite correct yet. But I need to call it quits now. I have started to work on a hyperlinked overview table of string dualities. It’s far from done and not quite correct yet. But I need to call it quits now. I included a link to Hořava-Witten theory, since this page deals with a series of dualities. Is there an image of the whole web of dualities to grab from somewhere? Shouldn’t that be type IIB? Format: MarkdownItexThanks for spotting this (unfortunate) typo! Fixed now. > Is there an image of the whole web of dualities to grab from somewhere? Working on it: [jpg](https://ncatlab.org/schreiber/files/TheFundamentalBraneScan.jpg) The full web won't be possible to arrange on a page: too detailed, too high-dimensional. But sometimes in the literature people have big diagrams of small snapshots. Will have to remind myself where I saw good ones, will include them then. Thanks for spotting this (unfortunate) typo! Fixed now. Is there an image of the whole web of dualities to grab from somewhere? The full web won’t be possible to arrange on a page: too detailed, too high-dimensional. But sometimes in the literature people have big diagrams of small snapshots. Will have to remind myself where I saw good ones, will include them then. Format: MarkdownItexPerhaps "the whole web" is too much to ask. With compactifications included it really is quite a thing. See how in [Umbral Moonshine and String Duality](https://arxiv.org/abs/1803.07567) compactification to low dimensions is related to the various moonshines. The author goes on to mention > the prospect that string theory could provide an intuitive reason for why the sporadic groups exist. Perhaps “the whole web” is too much to ask. With compactifications included it really is quite a thing. 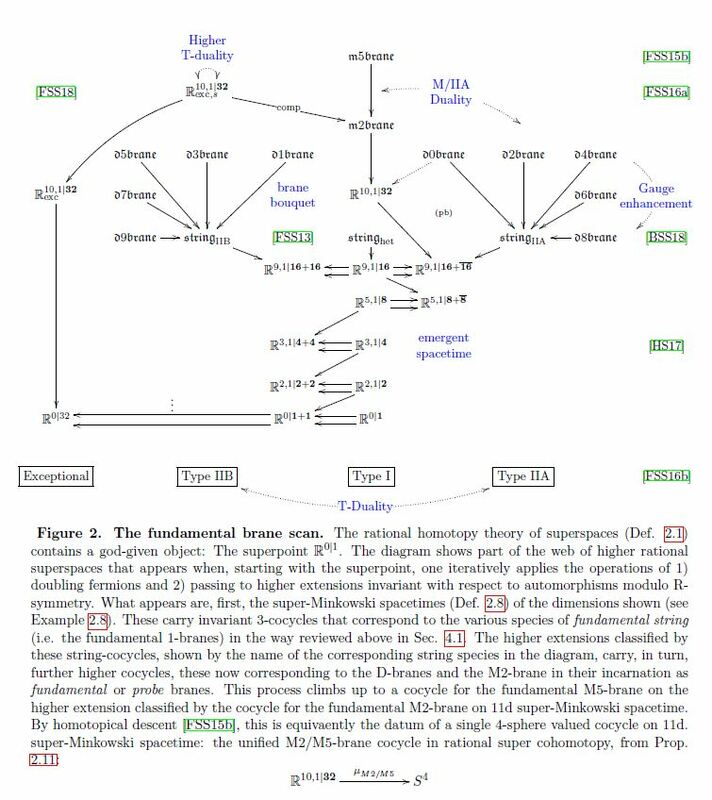 See how in Umbral Moonshine and String Duality compactification to low dimensions is related to the various moonshines. the prospect that string theory could provide an intuitive reason for why the sporadic groups exist. Format: MarkdownItexWould that be right though to see M-theory as some kind of extraordinarily rich exceptional object with a huge and diverse range of important consequences realised through dualities, limits and compactifications, from Geometric Langlands to Moonshine? So working backwards to find out what such a exceptional thing might be, it pays to attend to as much of the network of its manifestations as we can find out. Would it be the case that the closest parts of the network 'screen off' more distant parts, in the sense that, e.g., these Moonshine results in the paper in #5 as appearing in low dimensional compactifications are already 'derivable' from the close duals (the string theories, 11d supergravity)? Would that be right though to see M-theory as some kind of extraordinarily rich exceptional object with a huge and diverse range of important consequences realised through dualities, limits and compactifications, from Geometric Langlands to Moonshine? So working backwards to find out what such a exceptional thing might be, it pays to attend to as much of the network of its manifestations as we can find out. Would it be the case that the closest parts of the network ’screen off’ more distant parts, in the sense that, e.g., these Moonshine results in the paper in #5 as appearing in low dimensional compactifications are already ’derivable’ from the close duals (the string theories, 11d supergravity)? Format: MarkdownItexIs it just me and my browser or can others also not see the tables render properly at [[duality in string theory]]? On the other hand, individually they work, e.g., [[heterotic S-duality -- table]]. Is it just me and my browser or can others also not see the tables render properly at duality in string theory? On the other hand, individually they work, e.g., heterotic S-duality – table. Format: MarkdownItexFixed by re-rendering. There are things I wish to do to detect pages with problematic rendering, and also there are things that need doing with the renderer itself. Do not quite have the time just now, but hopefully soon. There are things I wish to do to detect pages with problematic rendering, and also there are things that need doing with the renderer itself. Do not quite have the time just now, but hopefully soon. for discussion amplifying the role of category theory, and higher geometry.